The BEST Pinterest Affiliate Marketing Course Available! In March 2018, I made $18,000 from a 5-day affiliate launch. More than 80% of the sales came from Pinterest. Oh, and I was 38 weeks pregnant when this happened! WHAT IF THIS COULD BE YOU? It can! In my new course, I'm going to show you the practical steps to making money passively on Pinterest. 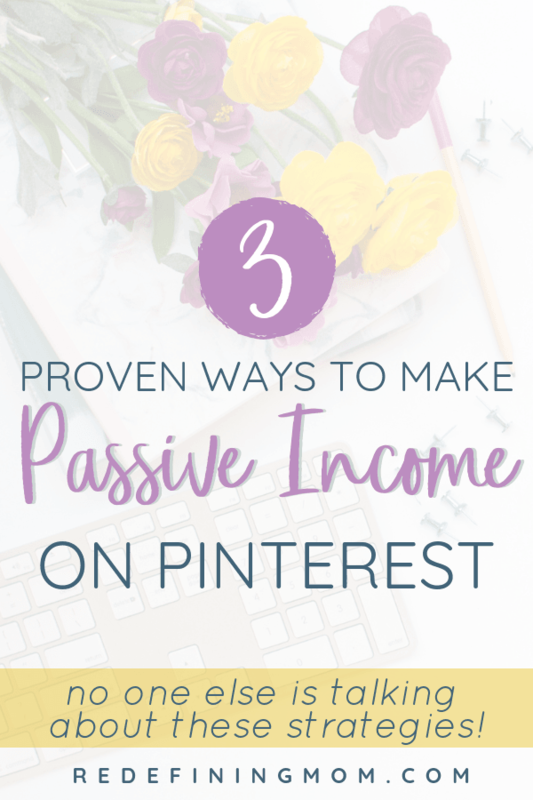 Learn the simple formula for turning your free Pinterest traffic into passive income! Affiliate marketing is when you recommend a product or service to your audience in exchange for monetary compensation from the product's creator/owner or service provider. Why not leverage the free traffic you're already getting from Pinterest to make money on products you already love? Thank you sooo much for your Pinterest affiliate masterclass. I've been looking forward to it since you announced it and it was totally worth the wait. I thought I was a pretty savvy affiliate marketer because I'd used Amazon and a few other affiliate programs with decent success on my teaching blog. Boy, was I wrong. I learned so much from this course! I went to half of Pat Flynn's affiliate webinar last week. This one was better. It shared more sophisticated information that better applied to my niche. I kept thinking it would be hard to do affiliate marketing on Pinterest but after this course I see affiliate marketing on Pinterest fits in with the way I currently use Pinterest. I'm still creating good content, great images and pinning consistently. Now I understand how to make the best decisions when it comes to running ads (promoted pins) for affiliate marketing as well. I think the course is in a great format. Easy to follow and understand, especially the action steps at the end of each section. Everything you do on Pinterest derives from having a good funnel in place. In Pin Practical Influence, I'll give you three funnels to leverage affiliates on Pinterest and drive passive income inside your business! This course taught me so much about sales funnels. Instead of throwing up random affiliate links to products I like or use, Monica presented an in-depth strategy to have a complete sales funnel with Pinterest as the focus traffic driver with multiple ways to earn affiliate commission in each funnel. Pin Practical Influence is very thorough and covered everything from the basic info to in-depth strategy and even an action list for each funnel type! I've taken another popular affiliate marketing course, and while I do think it's a great course, Pin Practical Influence was actually an amazing value comparatively as it lined out an entire strategy (actually 3 different ones!) that I can implement immediately. I love how Monica always brings IMMENSE value and shares all the details that she's learned so we can implement her exact methods and strategies. Hi! I'm Monica, a professional blogger and Pinterest marketing expert. I have an MBA degree in finance and marketing and blog at Redefining Mom, a site where moms thrive in both motherhood and business. In 2015, I traveled to the White House to discuss family-friendly workplace policies with the President's senior advisors and have been featured on several media outlets including Fox News, Healthline, and Mom Talk Radio. I provide online marketing education to professional moms who are looking to build profitable blogs through effective sales funnels and Pinterest ads. Will this class teach me how to use Pinterest? This class will teach you how to leverage Pinterest to create passive income with affiliate marketing. Pin Practical Influence does not cover the basics of implementing a Pinterest strategy. If you need help with the basics, my course Pin Practical Masterclass is perfect for you! I suggest learning the basics of Pinterest before proceeding to affiliate marketing on Pinterest. Will this class teach me the basics of affiliate marketing? This class will briefly cover the basics of affiliate marketing. The focus is on teaching you how to strategically leverage Pinterest as part of your affiliate marketing strategy. If you are looking to take a course about the basics of affiliate marketing, I recommend Affiliate Marketing for Bloggers (affiliate link). Do I need a blog/website to leverage the strategies in this class? Yes and no. In this class, I'll be teaching you three strategies for leveraging affiliate marketing on Pinterest. The first strategy does not require a website. The second strategy does require a website. The third strategy leverages a mixture of the first two. How do I access the Pin Practical Influence course? Great question! Pin Practical Influence is hosted on the Thinkific course platform. When you checkout via a secure connection with Thinkific, you will be prompted to create a username and password. After you create your username and password, you'll be sent to a secure checkout form where you can use any major credit card or PayPal for payment. Is there a Facebook group that goes along with the class? No. I offered the course live the first I ran it. During the live class, there was a 3-day popup Facebook group. Any reference to a Facebook group throughout the training is in regards to the 3-day popup group which is now closed. In order to keep the cost of the training reasonable, I will not be offering a Facebook group with this course at this time. Some of the basics you can find online for free. However, I teach in a very unique way when it comes to Pinterest. I focus heavily on creating funnels that convert into sales. This is very unique and not something I see being taught elsewhere. You'll have access to Pin Practical Influence for as long as the course exists. Including all updates to the core curriculum. This does not include guaranteed access to future bonuses. For specific details regarding access please review our terms and conditions. What is the refund policy for Pin Practical Influence? I am confident Pin Practical Influence can work for you. However, it cannot work if you don't put in the work. Please do not purchase if you are not willing to follow through with the implementing what you've learned. For complete details on our refund policy, please refer to our terms and conditions. Learn how to master affiliate marketing on Pinterest! This course is not endorsed by, owned or associated with Pinterest. All recommendations are the opinion of the course owner. Results are not guaranteed. All case studies are only examples and the results are specific to the website featured. Please refer to our full terms of service and earnings and testimonial disclaimer before purchasing or using any of Redefining Mom LLC’s courses or products.